It is also rich in fibre, foliate (folic acid), vitamin B6, iron, copper and magnesium. Other than applying avocado on your skin, consuming it in salad form can also be beneficial for your skin. Avocado contains vitamins like A, D, and E which has penetrating qualities to improve your skin. Avocado oil is also very useful for skin care. The oil is useful to remove any sun damage or age spots. It also softens the skin and provides a moisturising effect and can do wonders on damaged, undernourished and dehydrated skin. 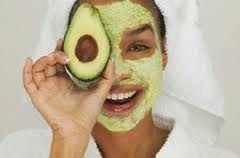 Cut avocado into slices and place it under each eye and relax with it for the next 20 minutes. The changes would be remarkable. Make an eye cream by mixing 5 drops of almond oil in 3 ripe slices of avocado. Blend this mixture and dab it around your eyes. Keep it for five minutes then rinse. This facial mask is useful for dry skin. Mash half avocado and apply it leisurely on your face. Keep it for 15 minutes and then rinse it off with warm water. Make a paste of ½ ripe avocado mixed with 1 tsp vegetable oil. Apply this paste on a washed and clean face. Leave it for 15 to 20 minutes. Rinse it with warm water. This masque is very good for dry skin. Make a paste by mixing 1/4 peeled & smashed avocado, 1 egg white, 2 tbsp oatmeal and 1 tsp lemon juice. Apply this paste on your hand and leave it for 20 minutes. Rinse it with warm water and pat it dry. You would be thrilled by the results by using it regularly. You would need 2 tbsp flax seeds, 1/2 mashed banana and 1/2 avocado peel. Use a small bowl to mix flax seeds and banana. Scoop the banana and flax seed by using avocado peel. Massage this scoop on your face in circular motion, slowly and gently. Rinse it with warm water. Thank you for your comment. Yes, you are correct in saying that we offer hair as well. We offer 100% Remy human hair in both bulk for braiding and weft for weaving in a range of colours from black to blonde. If you are interested in buying hair please email sales@ofili.co.uk.